Euthanasia Prevention Coalition Euthanasia Prevention Coalition: It is impossible to support euthanasia of any kind. It is impossible to support euthanasia of any kind. A good friend of mine, asked me tonight via email about what she should pray for in current euthanasia battle in Canada. She wondered whether we should pray for the most restrictive legislation possible or should we pray that the very notion of legalized killing should vanish — in other words, a miracle. Of course, a miracle would be great. Even more miraculous would be to see all pro-euthanasia politicians, some real enthusiasts for medicalized death, suddenly change their minds. I have become entrenched in my own position against euthanasia. Not because I am stubborn but I find it impossible to support euthanasia of any kind. It goes against everything I believe in. To try to help craft a "safe" bill, or even pray for a safe bill, would haunt me forever. I may not be able to stop the inevitable but I can ease my own conscience by not going along. We should keep praying and working towards its destruction. Cardinal Thomas Collins appeared before the parliamentary committee that is attempting to craft a safe law. He refused to help them. He kept repeating euthanasia is wrong. The committee members were frustrated. But who cares. They are acting as the agents of death. To my mind, you cannot oppose euthanasia and at the same time help craft a safe law. It would be like being against the death penalty but seeing nothing wrong in designing a painless noose or a quicker, more efficient poison to send a prisoner on his way to the next world. Besides, what is a safe law? The Supreme Court ruling of last year left things wide open. That means if the government is too narrow in its legislation, it will likely end up back in court. Even excluding further involvement by the courts, the likelihood of a safe law remaining restrictive is slim. This is what happened in Holland and Belgium, to the shame of both those countries. As demand grew for pre-natural death more and more ailments and conditions, many not lethal, were approved for state-sanctioned killing. It is strange for me that Allied soldiers, like my father, fought in those countries to get rid of the Nazis, the biggest promoters of death as a response to so-called imperfection. Did these countries learn nothing from the Occupation? The parliamentary committee will not listen to us. The members are just following orders. One Catholic member of the committee, looked at Cardinal Collins with piety in her eyes, and said what I consider a classic cop-out: "I'm a Catholic, but…" There is always that "but." This is not a religious issue but religious people are inculcated with a sense of moral responsibility. Atheists can see that it is wrong to take a life. The problem is right now the vast majority of both groups have lost their sense of right and wrong. And at this rate it may take generations to get it back. 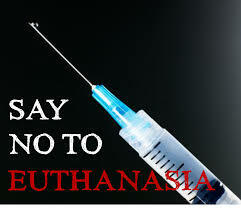 We should continue to be against euthanasia even when a law is passed. Some laws are immoral and they do not become moral over time: forcing blacks in Alabama years ago to give up their seats to white people or Germans slowly eliminating Jews from public life in the 1930s are just two examples of legalized immorality. These laws became more odious the more they become part of the fabric of society. Realistically, legalizing euthanasia will take this current partial culture of death and ramp it up to a total culture of death. How could we not pray against this forever. Link to other articles by Charlie Lewis. Charlie Lewis is a contributor to The Catholic Register. He was a mainstream journalist for 33 years.